When the sun is shining it’s hard to imagine the world any other way. When the sun is shining and you’re sat in the garden eating a big bowl of vanilla ice cream, life is good. 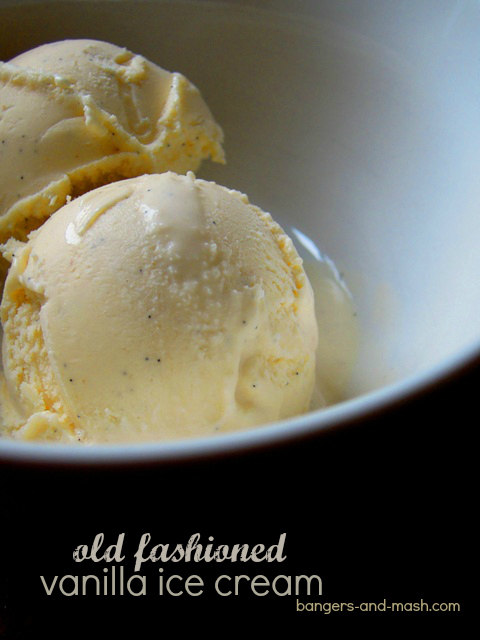 Especially when it’s homemade vanilla ice cream made the old fashioned way with a proper custard. I don’t know how long this warm weather is going to last. I don’t generally bother to watch the weather forecasts. But it was gorgeous yesterday and it’s gorgeous again this morning. So we shall make the most of it. Yesterday we spent practically every minute, once we’d got the dance lessons out of the way in the morning, in our garden. Playing swing ball, cutting the grass, weeding, planting seedlings in the vegetable patch, having a barbecue, washing the car, running through the water sprinkler. Even the chores are enjoyable when the sun shines. Almost felt like we were on holiday in our own home. And when you are on holiday you eat ice cream. At least I always do, anyway. I was given my first ever ice cream maker a couple of months ago for my birthday. The children have been thinking up all kinds of weird and wonderful flavours for us to experiment with, but before we move onto those I was keen to master the classic vanilla. Good ice cream isn’t difficult to make yourself but it does require patience. I’d always assume that an ice cream maker would mean you simply put everything in a pot and it transforms it into ice cream for you, when actually it’s key function is the churning, the constant stirring while the ice cream freezes to prevent ice crystals forming. Our first attempt was a disaster. The custard was rushed and it wasn’t lovely and thick before it went into the maker, and so the ice cream just didn’t thicken. So when it came out of the freezer, it was one large ice block that was practically impossible to get into. But the second attempt was just perfect and I spent much longer at the stove, stirring the custard until it was beautifully thick and glossy. The ice cream was softly sweet and creamy, with that oh so comfortingly familiar flavour of delicious vanilla, and I imagine I’ll be making many, many more batches of this particular recipe. You can of course use vanilla extract for this recipe, but I prefer to use a vanilla pod. You see all those pretty little black seeds in the ice cream, and you can wash the pod afterwards and use it to flavour your sugar. Oh and don’t forget to put the canister from your ice cream machine into the freezer the day. Vanilla just happens to be the theme this month for The Spice Trail challenge, which this month is being guest hosted by Solange over at Pebble Soup who is doing an incredible job attracting an eclectic collection of wonderful vanilla recipes. Do pop over there to take a look and of course, if you’re cooking with vanilla this month, why not add your recipe? There is a fabulous prize for the winner – a selection of Steenberg organic extracts and essences from Naturally Good Food, including vanilla of course. Pour the milk into a heavy-based saucepan. Split the vanilla pod with sharp knife and scrape out the seeds into the milk. Pop in the pods too and give it a good mix. Place the milk onto a medium heat and bring to the boil. Quickly remove it from the heat, cover and leave to stand for 20 minutes. In a large bowl, beat the egg yolks well with the sugar and then stir in the milk and vanilla. Remove the vanilla pod and then pour the mixture into the saucepan again. Cook over a low heat, stirring all the time with a wooden spoon until the custard thickens and covers the back of the spoon. This will take around 10 minutes or so. Don’t let the mixture boil or it will split, and do wait until it has thickened or your ice cream won’t set properly. Once the custard has thickened, pour it into a clean bowl and leave it to cool. Then whisk the cream into the custard. Cover with cling film and place in the fridge until is completely chilled. I left mine in the fridge overnight. You then tip the mixture into your ice cream machine and freeze following the instructions provided. Transfer to a plastic container and freeze until required – if you can resist plunging straight in. Alternatively, if you don’t have an ice cream maker, you can freeze once you’ve whisked in the double cream for around four hours, remembering to give it a good stir once an hour to break up any ice crystals that are forming. Serve in bowls or in wafer cones. Enjoy! I am entering my vanilla ice cream into The Spice Trail’s Wow Vanilla! challenge hosted by Solange Berchemin over at Pebble Soup. I sometimes cheat and use luxury ready made custard from M & S. It’s just as nice and good if you don’t have a lot of time. That’s a great idea, Marie. There are some really good ready-made custards around now too. that looks so good! 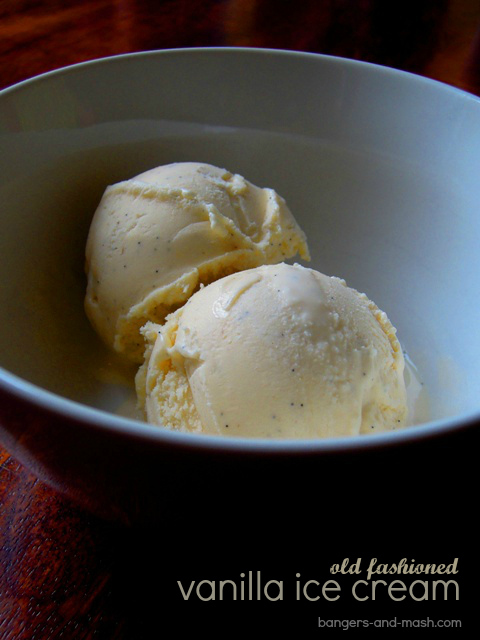 I haven’t used my ice cream maker in so long, I must dust it off & try some vanilla ice cream! Ice-cream makers are fantastic…. I love mine!!! My daughter has been nagging me for vanilla ice cream lately and this certainly looks like a gorgeous recipe. Bookmarked! So good to see a vanilla ice-cream on The Spice Trail, this month.